In Merlin’s Mirror, the legend of Arthur is reborn into science fiction. The old legends of Europe hold that Arthur, greatest of Britain’s kings, was conceived by the trickery of the wizard Merlin. Merlin himself, the tales go, was demon-born, the son of no man. But what if both were the sons of no man – the sons, rather, of the Sky Lords, aliens seeking to return to Earth? This is the essential idea of Merlin’s Mirror, a science fantasy novel by Andre Norton. The book takes classic tenets of fantasy and works them into a sci-fi universe, and thus the legend of Arthur is reborn into science fiction. There is no “magic”, properly speaking, in Merlin’s Mirror, just misunderstood technology. 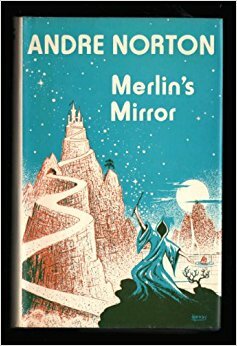 Published forty years ago, Merlin’s Mirror is old school: an omniscient viewpoint combined with a brevity that is now almost extinct. This slim volume covers in 205 pages what modern novelists would need a trilogy to tell, and possibly a longer series. It was oddly refreshing to read the story of Merlin’s entire life in one book – just to see it told in its essentials, without chasing the enticing side trails all modern novels have to run down. But the downside of this style of novel-writing is also evident. The novel took Merlin’s ruling motivation (to carry out the mission given him by the Sky Lords) too much for granted; it puzzled me initially. The brevity hurt Merlin’s characterization in other ways. As a character, he is stained by his manipulative role in Arthur’s conception, showing no reluctance beforehand and little reflection afterwards; the story sweeps on, and Merlin is worse for it. Nor does the novel make it clear, until the very end, that Merlin really cares about anything besides his mission. So although he is in some ways admirable, and in other ways pitiable, he is not really likable. Norton retains much – not all – of the original unpleasantness of Arthur’s conception and of Mordred’s. This, together was Nimue’s (failed) temptation of Merlin, adds a few raw moments to the book. I did not enjoy it, though I realize that as modern standards go – in some respects, even as the original legends go – the book is mild. Merlin’s Mirror presents the clearest religious view of any novel I have read by Andre Norton. Yet it is still murky. Aside from presenting a more elegant version of the Christ-as-moral-teacher viewpoint – making Him great, yet only one of many who had seen “the Great Light” – the narrative makes little clear. “The Power” – a phrase of which Merlin proved fond – sometimes refers to knowledge or alien technology, and sometimes seems to be religious, and so confuses the story. The ending was clever in its own way, and almost hopeful; it had a sense of anticipation, at least. But more than anything else, it was sad. The last pages of the book cast doubt on Merlin’s mission, a doubt compounded by the ambiguity of “the Power” and the immoral means once used by Merlin. This is the worst thing: that Merlin, for all his power and dedication, may have been only a tool or victim. He also may not have been, but a confusion sets in near the end of the book, and it’s hard to tell precisely how certain things are meant to be understood. With an innovative premise, and even some emotional power (“lonely Merlin” – sniff! ), Merlin’s Mirror intrigues but it does not satisfy. I want to read this. I love Arthurian legends, so I’m super curious now! Thanks for reviewing it! Also is anyone familiar with this oldie: Poul Anderson’s “The High Crusade”? Members of medieval society are transported by alien ship accidentally to an advanced society. They do so well that “modern” Terrans are surprised at the Plantagenet (star) empire they find when they get out there. He wrote several novels similar such as “Three Hearts and Three Lions”. His friend Gordon Dickson tried his hand at this too. And Randall Garrett’s Lord Darcy (& Father Sean) mysteries set in an alternate universe where magick is the proven science of their world, a magick which is morally positive and does respond more like science.